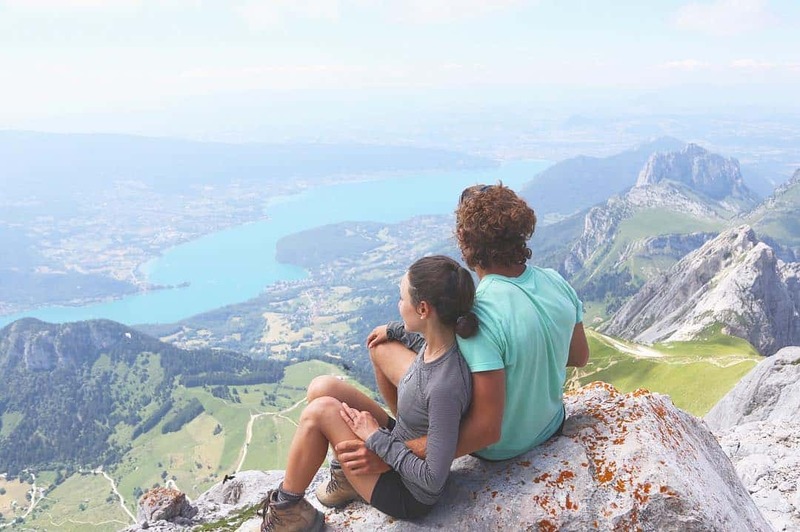 For our latest edition of Gnomad Homies International, we feature Brittany and Drew from @MrandMrsAdventure! 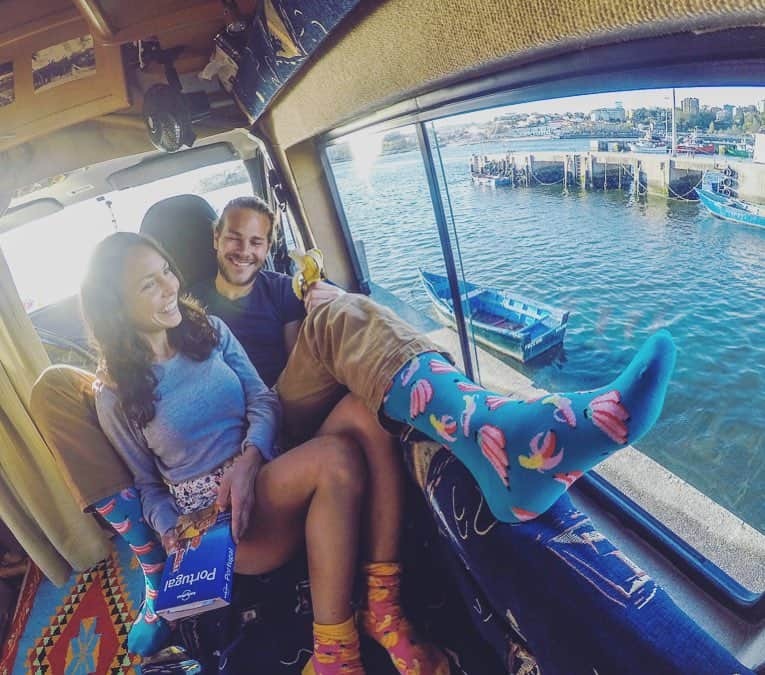 They have been rocking this van-livin’ lifestyle for not only THREE WHOLE YEARS but also ALL OVER THE WORLD – from Ireland and England, to France and the Netherlands, to Morocco and Portugal and Norway and so many other beautiful places. 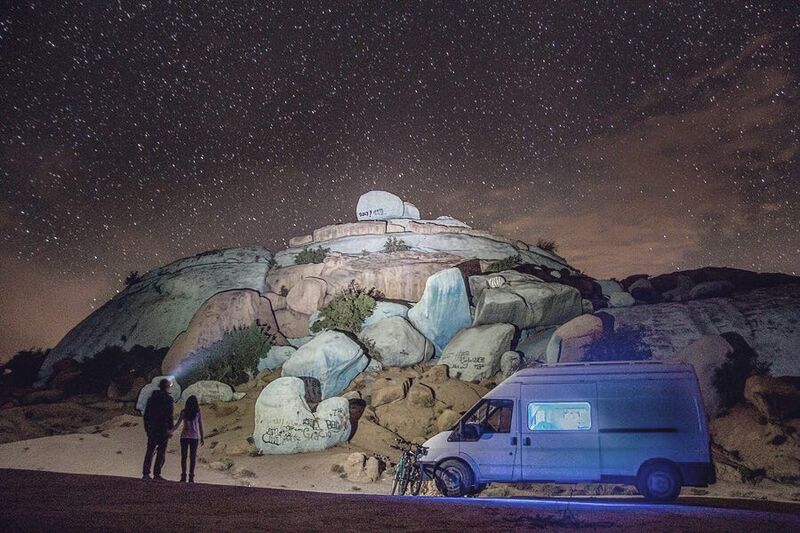 Give their story a read and feel inspired to buy a plane ticket first – and THEN your van! 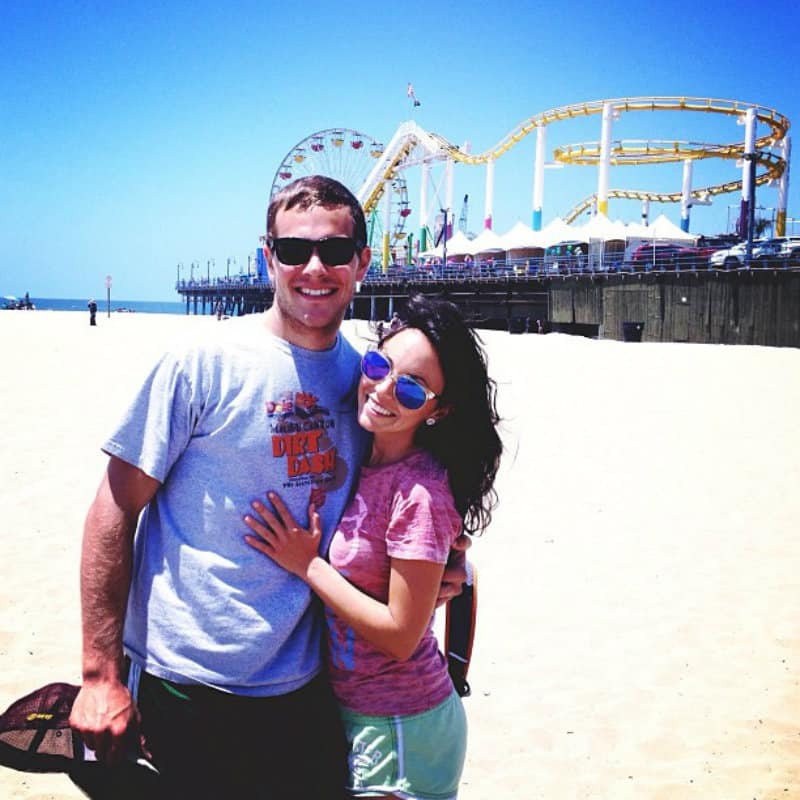 Drew was born and raised in Michigan and Brittany in South Florida, but after graduating from college at the University of Florida, where we met, we moved across the country to Los Angeles, where we lived for 4 years before taking to the road. Down by the Duoro River in Porto, Portugal. 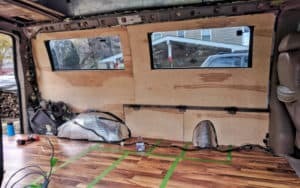 Home is our British, 18-foot Ford Transit that was custom converted prior to our purchase 3 years ago. It’s important to mention that it’s British because the steering wheel is on the right hand side of the van, making driving in mainland Europe (where road directions are the same as in America) quite interesting, especially when people look over and see feet sticking out of the driver’s side window. We sleep on a futon-style, pull-out bed that we make each night and we have a 3-burner stove top, gas oven (pizza! 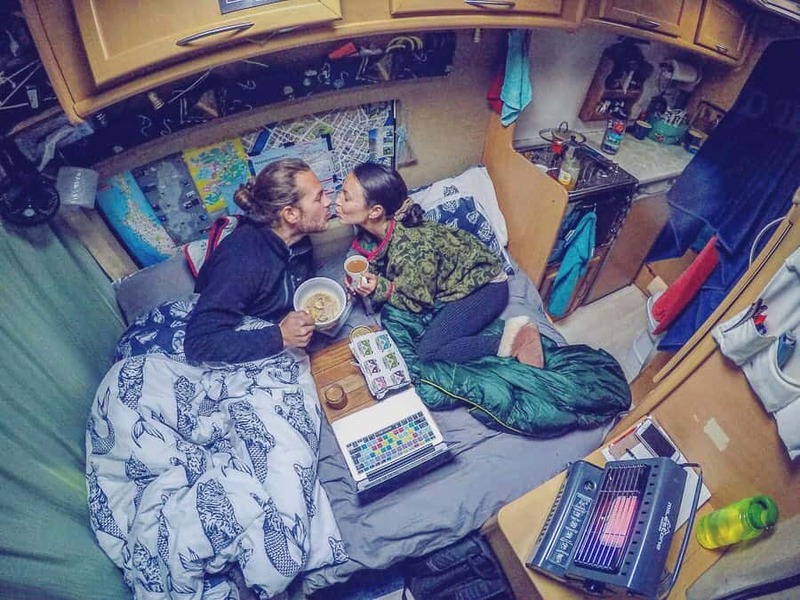 ), 3-way fridge + freezer, sink with running water, cassette toilet and a “garage” where we store our bikes inside the van (great for “stealth mode” in countries where wild camping is illegal). 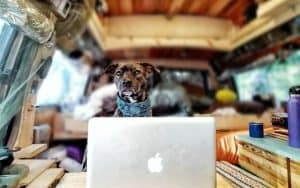 We are full-time VanLifers. In addition to our European van home, we own nothing but a tiny 5 x 5 ft storage unit in San Diego, California. 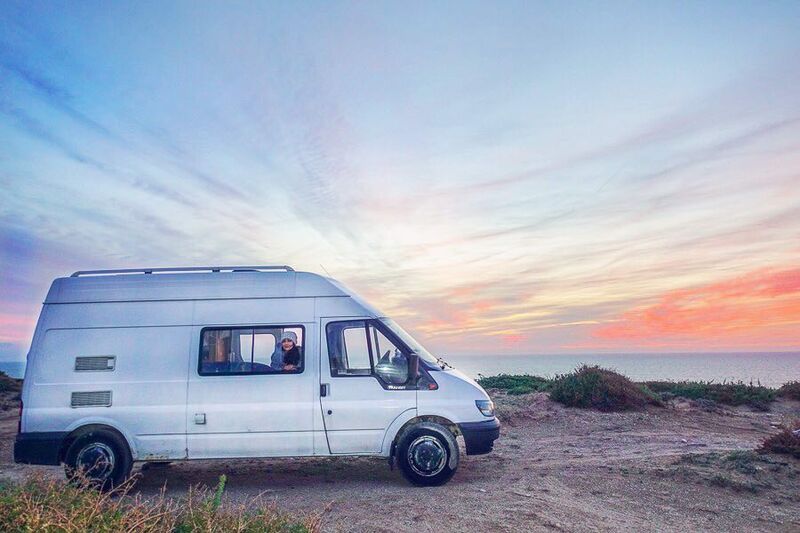 Our goal, after selling our European adventure van, is to build out our own custom rolling home to live, love and continue adventuring in back in the US… and beyond. 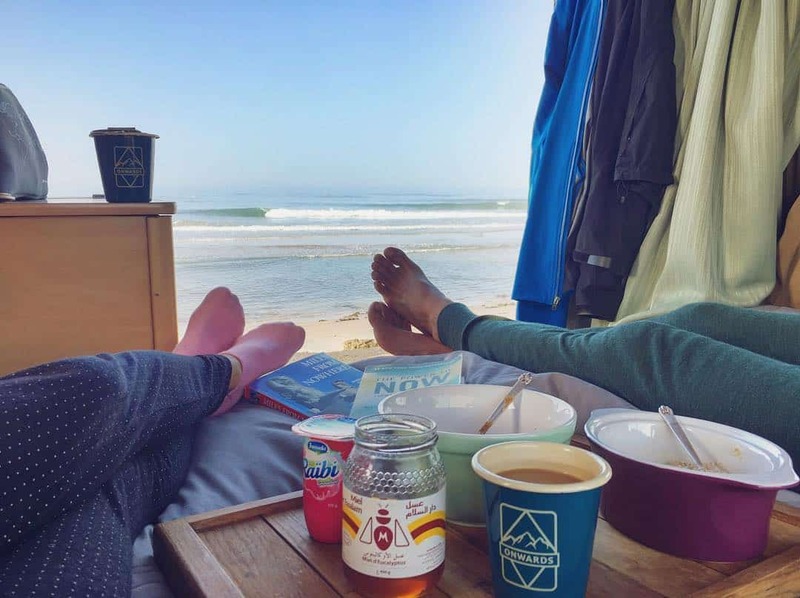 What’s your favorite part about living the van life? Our favorite part: FREEDOM. We love not being committed to a schedule. If we like a place and want to explore/call it “home” longer, we’re free to stay! On the other hand, if we’re bored of a place and need to satisfy our restless souls by moving on, that’s great too! We always have what we need… each other, and we’re always ready to roll. 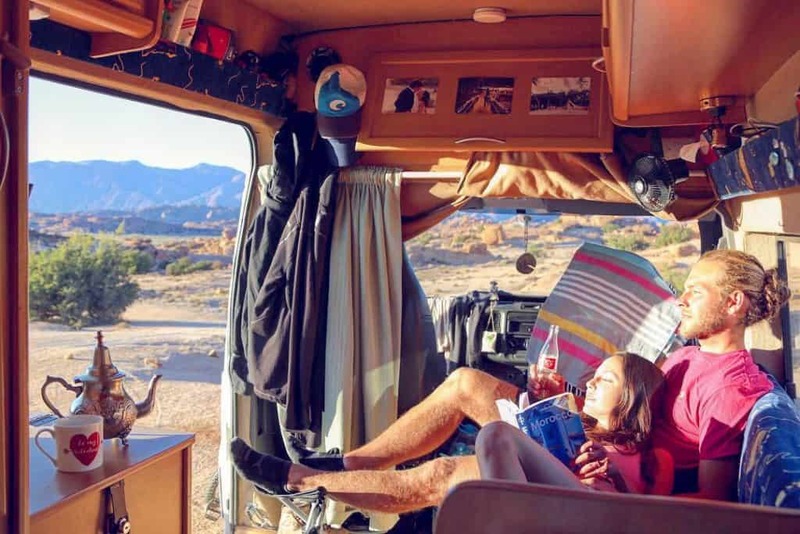 What is your least favorite part about van life? 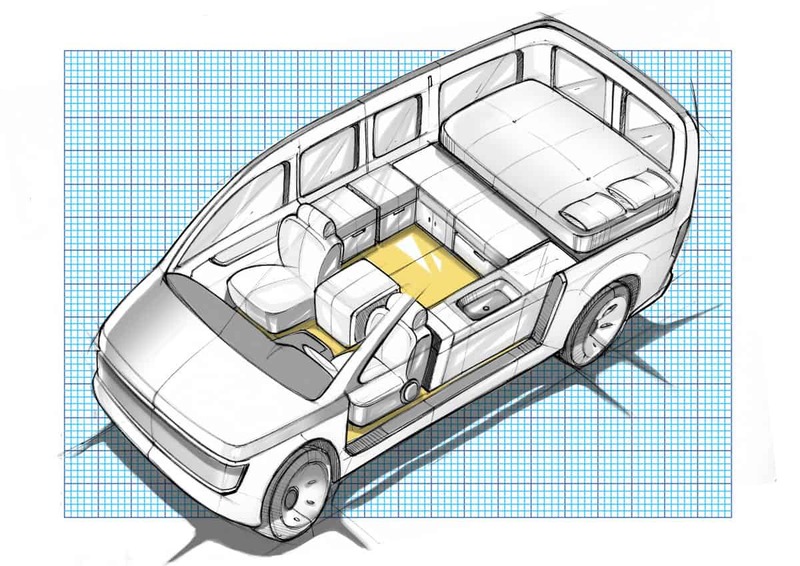 Our least favorite part: While we continuously face the expected challenges of normal VanLife, we face them in a more complicated way. 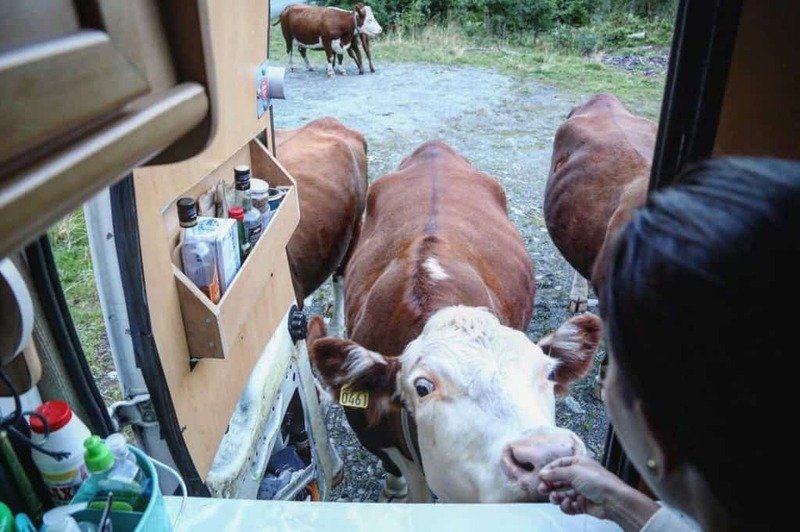 Think different countries, with different languages, different customs, different electrical + gas adaptors, constantly changing store names, exotic foods (which is especially challenging when you’re allergic to gluten like Brittany) and unclear parking + wild camping regulations. 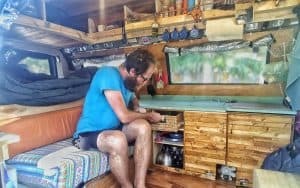 Another thing about VanLifing in a country that isn’t your own is that you are constantly feeling like a fish out of water. On top of not speaking the same language as those around us, being miles away from family or friends, going days without finding a hot shower and constantly not knowing things (like where to go for car parts that fit our English van, wifi, cash withdrawals, laundry, refilling our propane tank), we also have Visa restrictions to worry about! Yes, it’s extremely challenging, but for many reasons, we love, love, love it anyway. I was working as the head of Intake, Aftercare and Admissions at an eating disorder recovery center in Santa Monica, California. I was being over worked, underpaid and was feeling drained by the emotional weight of my position. Drew was working in sales for a company in the Hollywood Hills that refurbished vintage luxury watches, like Rolex, Cartier, etc., and sold them for big money. He was feeling passionless and a bit disconnected from his values. It wasn’t long before we found ourselves living for the weekends. We sought the peace and solitude of nature and one weekend in particular we decided to make the drive to Zion National Park. It was here where we made a pact that in April of 2016, we would quit our jobs and travel the world… 6 months later we ended up realizing that goal – 2 years early. 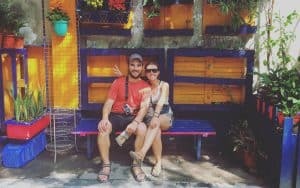 Being Americans living in a van in Europe (for 3 years!) feels like a completely unique existence. We have such a deeper understanding of life over here, and while we miss America in many ways, we have come to value certain things that we’ve found to be missing from life in the US. Additionally, we love our bed. Any given morning, when we’re craving a good dose of “feeling cozy,” we’ll slide our giant, side door open so we can take in the grand view of the day, all while indulging in all our favorite simplicities: breakfast in bed, wearing our pj’s nearly all day, drinking cup after cup of tea, reading whatever book is captivating us at the moment and trying to write all of our favorite memories down in our travel journals. Drew has had the fortunate opportunity to remotely manage a small radiology company that he previously worked for, which affords us the ability to live simply, and we are able to score some pretty cool free/paid experiences through the blog and social media. The islands of Croatia, because the Adriatic is INSANELY beautiful. Lofoten, Norway because the wild camping + hiking are unprecedented. The Western Coast of Portugal because the vibes are super chill. Dakhla in Western Sahara and Tafraoute in Morocco because they are unlike anywhere else we have ever been. 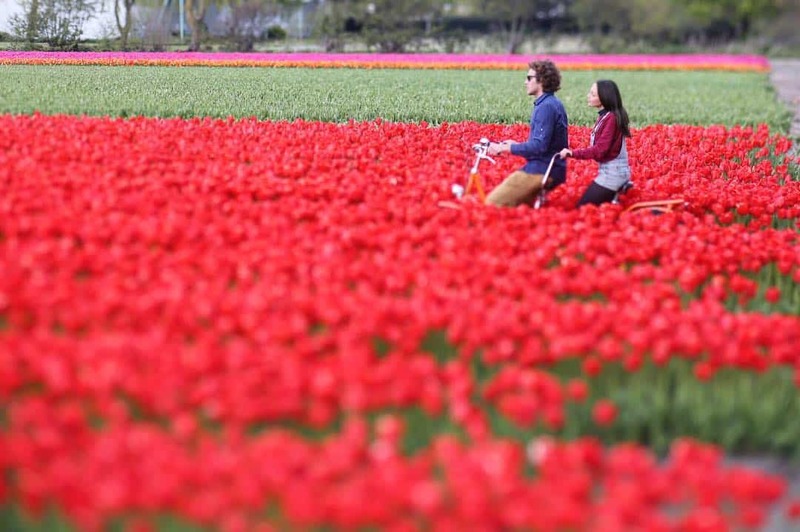 Gosh so many more, Cornwall in England, the Dingle Peninsula in Ireland, Lisse in the Netherlands (during tulip season) and we’ll end our list with Lake Annecy and Quiberon in France. What are some things you brought with you that you use nearly everyday? 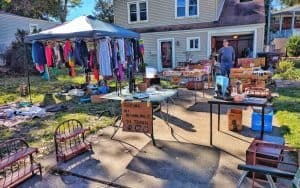 What are some things you brought with you that you ended up never or rarely using? Everyday? Toothbrush and back roller. Things that we never really use that we brought: oversupply of books, a pair of heels I haven’t yet worn and a few jackets that we hide in the back of our closet. 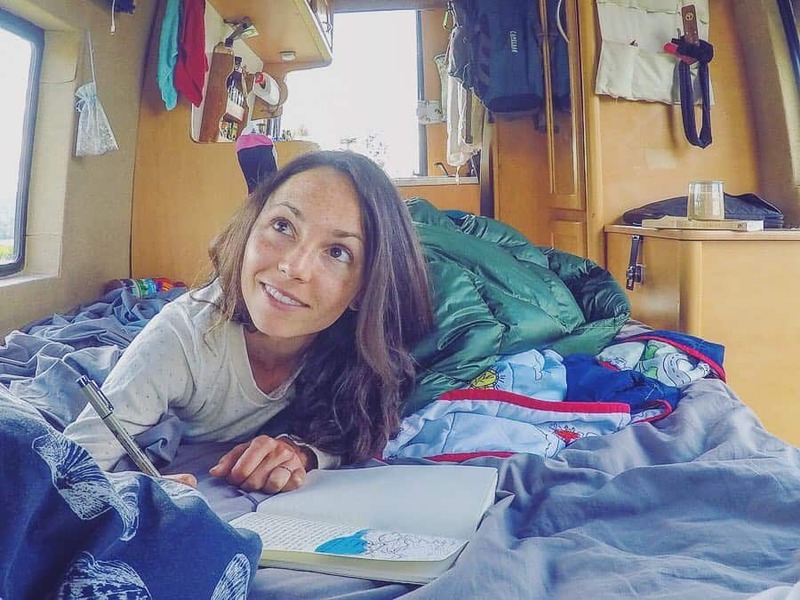 It depends on the day, but I’d have to say that as an early riser who married a late riser, I miss being able to wake up early for my “me time.” I would walk into the kitchen to make a cup of tea, do some yoga, catch up on writing, meditate and go on my morning run, but in the van I know the slightest movements will wake Drew up, and depending on where we are parked and the temperature outside, I can’t always comfortably leave the van for my “me time.” Plus, my clothes cabinet is blocked when our bed is out, so unless I want to greet the world in my PJ’s I have to plan ahead for any solo morning excursions. As for Drew, he misses his hot morning showers more than anything. Journaling, poetry writing, filming, video editing, reading, meditating (or at least trying to), cooking new recipes and simply just taking the time to be together and live life’s most beautiful moments slowly. 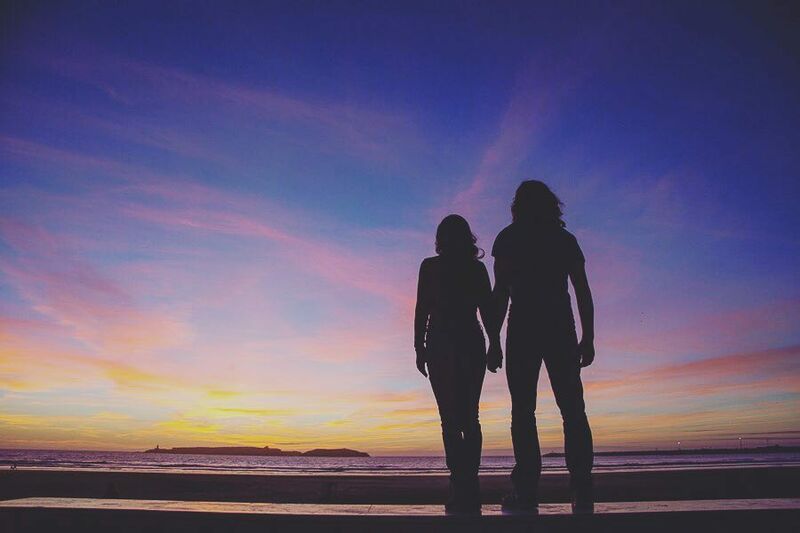 Watching sunsets from the van has got to be one of our favorite thing to do together. 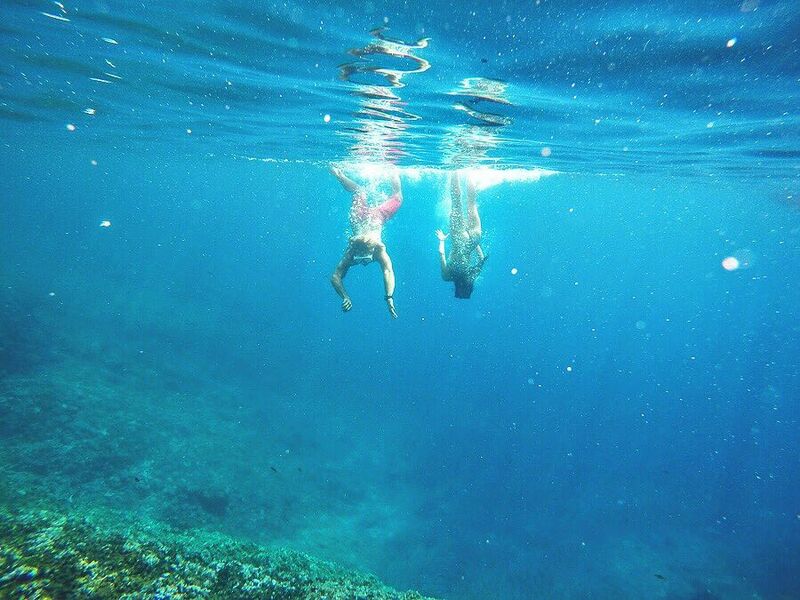 Life without walls is one of the most beautiful ways to live, let alone one of the most affordable ways to travel. Prepare to taste REAL FREEDOM, to explore your world without reservations and to indulge in the simplicity of living the simple life. You will be stripped of your comforts, but in turn, and in time, you will discover your truest self, and THAT is priceless. 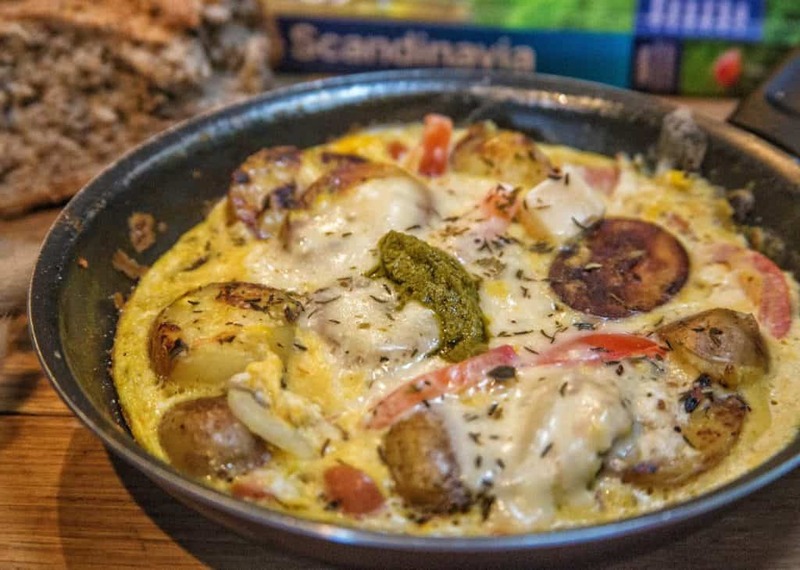 Well, we did contribute the “Hakuna Fritatta” recipe for your United We Van cookbook, which is one of our fave, easy dishes to make! I’ve also been experimenting with soups lately, specifically “Caldo Verde,” a traditional Portuguese green soup. 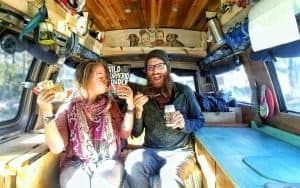 Don’t forget to give Brittany and Drew a follow on Instagram, Facebook, YouTube and be sure to check out their incredible blog as well!For more exciting vanlife stories and adventures be sure to give us at Gnomad Home a follow as well on Instagram and Facebook! Of course, we loved learning about your story and your adventures! Hopefully we can meet up on the road some day!